The answer to this ancient and celebrated riddle, says Edward Harrison, seems relatively simple: the sun has set and is now shining on the other side of the earth. But suppose we were space travelers and far from any star. Out in the depths of space the heavens would be dark, even darker than the sky seen from the earth on cloudless and moonless nights. For more than four centuries, astronomers and other investigators have pondered the enigma of a dark sky and proposed many provocative but incorrect answers. Darkness at Night eloquently describes the misleading trails of inquiry and strange ideas that have abounded in the quest for a solution. 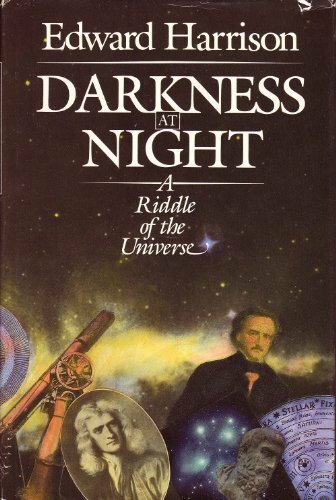 In tracing this story of discovery--one of the most intriguing in the history of science--the astronomer and physicist Edward Harrison explores the concept of infinite space, the structure and age of the universe, the nature of light, and other subjects that once were so perplexing. He introduces a range of stellar intellects, from Democritus in the ancient world to Digges in the reign of Queen Elizabeth, followed by Kepler, Newton, Halley, ChÃ©seaux, Olbers, Poe, Kelvin, and Bondi. Harrison's style is engaging, incisive yet poetic, and his strong grasp of history--from the Greeks to the twentieth century--adds perspective, depth, and scope to the narrative. Richly illustrated and annotated, this book will delight and enlighten both the casual reader and the serious inquirer.